To be honest, I may never actually get round to writing a review on all the products I've used this year so this is an opportunity to share the best products I've used starting with deep conditioners because this season is the season of dryness especially fortype 4 naturalistas like me. - have a lot of slip for detangling...because I usually deep condition after a long term protective style and my hair gets very dry and tangled. - will penetrate deep into my hair strands and really hydrate and strengthen my hair. This year, here are my favorite deep conditioners with amazing slip!!!! This organic, all natural , locally sourced cow butter delivers all the time in terms of slip and hydration. It makes detangling my tangle prone hair easier. I also like the yoghurty smell. I can't leave it in though unless I want to smell like rotten milk afterwards. I'm missing it right now because my Fulani milkmaid friend just moved and I loved how hygienic she was about handling the butter. Sob sob!!! This is my second favorite deep conditioner and in my opinion is one of the best of the SheaMoisture Masques. I've tried the SheaMoisture Raw Shea Deep Treatment Masque, SheaMoisture JBCO Treatment Masque, SheaMoisture Superfruit Complex 10 in 1 Masque and SheaMoisture Tahitian Noni and Monoi Masque and I keep going back to this Masque. It is now a staple for me. It has good slip and doubles as both D.C. and Clay poo thus it is also a travel essential and has worked well in both wet and dry seasons. A light product with very good slip too. I'm in love with the citrus scent and by experience this product works very well for both natural and relaxed hair so can be very valuable for transitioners. Again good slip.....can you see how slip is important to me??? Slip helps reduce breakage and tangles!!! It also penetrates deep into the hair. 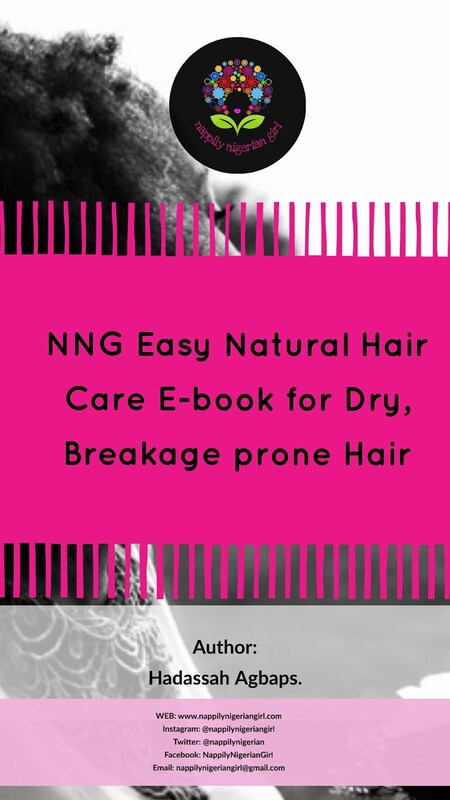 My best practice is using it on dry to damp hair. Very helpful when it comes to detangling with a comb. Need I say slip?? It is also easy to find in brick and mortar stores around Nigeria and cheap too...max N1200 for 30oz. The only draw back is you'll have to rinse out all that slip thoroughly and also try to get out the tiny bits of parsley leaves. I buy this in emergency cases....especially when I run out of detanglers and I'm in a new town. This product also has very good slip, penetrates and hydrates even the driest hair! It smells very nice too which is good as the scent sticks. Your significant other wouldn't mind your long hours in the shower when you use this! While this isn't technically a deep conditioner, I discovered it gives the same hydrating results as a deep conditioner which gives you more bang for your buck. It is a staple for my sis with medium-low porosity natural hair after the Beautiful Textures Rapid Repair Conditioner. 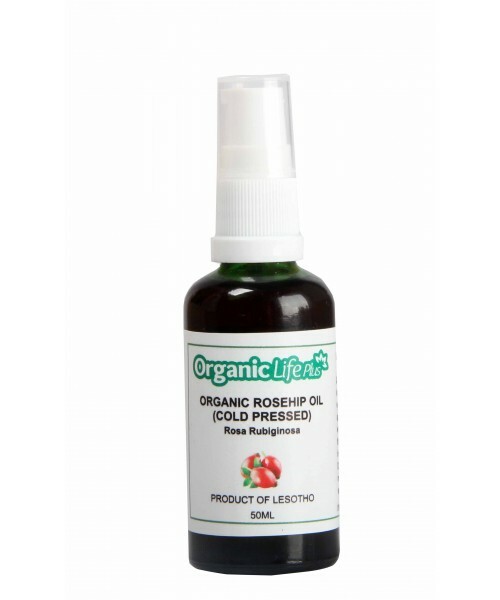 It has really nice ingredients and safe enough for those with an organic regimen. It's not silicone free though I find it doesn't build up and can work as a cowash too. I'm very specific about this type of Tresemme conditioner because it provides the best slip of all in my opinion. It is also not technically a deep conditioner but I discovered it works very well with a heating cap. 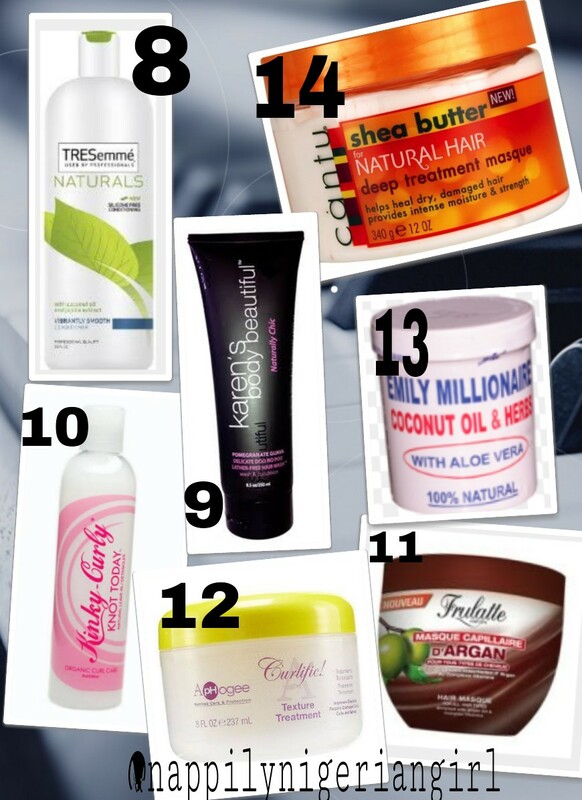 What's a hair wash doing in my list of deep conditioners you might ask? Seriously, I may have missed this amazing product if not that it was on sale. It has really good slip, smells amazing, cleanses hair like the co wash it is but one day, I covered my hair with a shower cap so I could shower and by the time I remembered to rinse out my hair, it was soft and shiny. I was expecting it to be mushy but my high porosity hair felt strong and flexible! So, I'm including it in my list.....what's better than a multi tasking product??? Again, not a deep conditioner and the slip is not predictable....some days I see what the hype is all about, some days, I wonder why I waste my money repurchasing this product. The only reason I do is when mixed according to KimmayTube's formular with Aloevera juice, oils et al, it makes my hair feel amazing especially as a deep conditioner. I keep buying the Aloe Vera Juice which I use as a skin toner and since it's such a big bottle of juice for my face alone, I use it for my hair too! So it keeps coming back because it is married to the Aloe Vera juice and their baby is my springy coils! I stumbled on this product in a store, tried it out, loved it, borrowed money from my sister, ran back to the store and bought the remaining two because I know it's never going to be in stock again after that! The End! Errr.... if you see this product anywhere, grab that ish!!!! I tried this because of Christine of Mane Objective's review to see if it will work as well on my hair as it did hers. While I can't say I love it as much as I do SheaMoisture Purification Masque, I can definitely say it did what it says it will do which is strengthen and improve elasticity of your hair especially if it is colored hair. I recommend this product. 13. Emily Millionaire Coconut Oil and Herbs with Aloe Vera. I don't understand all that went into this product including its 4 day action claim (to do what exactly???) but I understand how it consistently restores moisture to dry, tangled hair making detangling less of a hassle. It doesn't have as much slip as the rest of the deep conditioners above, so maybe it's out of place in this list but it does coat the hair strands and protect it from damage while detangling with minimal breakage so yes, it has earned its place on my list plus one can't go wrong with the N400 price tag! I love this conditioner but not so much a fan of the coconut scent which get to me. Everyone that had sniffed it absolutely loved it including the guy guy, so I guess I'm just odd. Anyway, scent aside, this deep treatment masque is actually very good and I guess if I run out of the above 13 options, I'd purchase in a heartbeat! So there you have it! 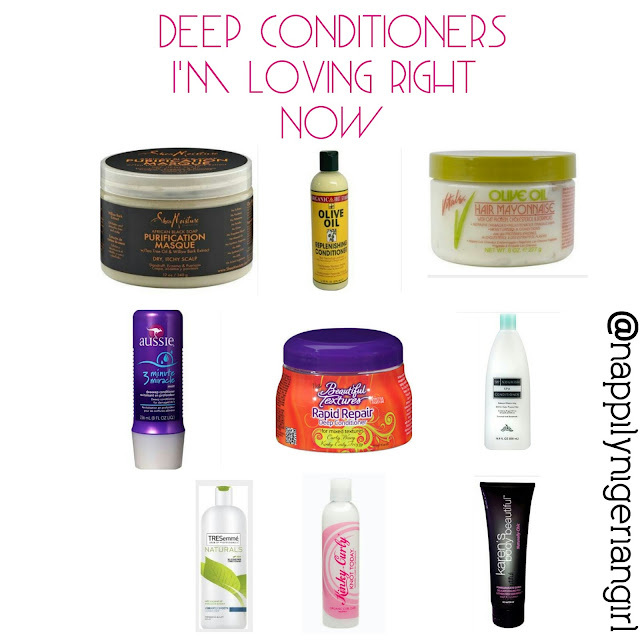 A lot of great deep conditioners to choose from, yeah?! 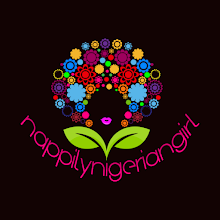 This harmattan will not dry out our natural hair....Amen!!! 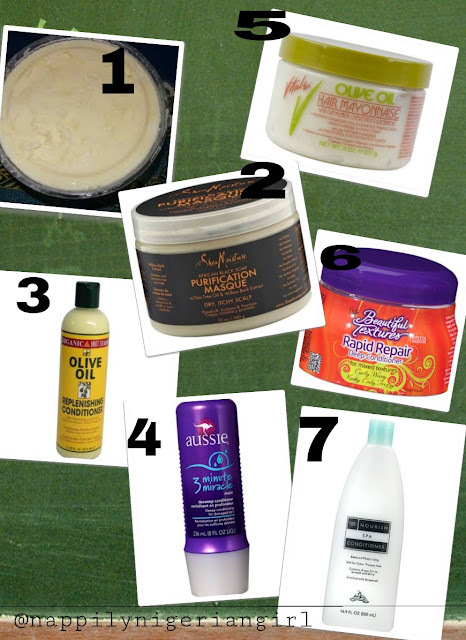 So guys, what are your top, holy grail deep conditioners for dry, cold weather? Men, that is a lot of DC!!! Lol! They are some of the DC I've tried over the years and loved. I like trying out new products though to discover new gems but you can select any one you can easily get your hands on if you're not sure about DCs. Hi Beautiful Eagle, can you share your process so we can see what the problem is? Hey hey my love is here: the SM Purification Masque. That right there is bae. I used the Beautiful Textures one while transitioning and kai, it did nothing for my hair except make it smell amazing. I reviewed it sef. I had lovely scented, dry hair. Lol. Different strokes. I resorted to using as a leave-in till it ran out. I really liked the Emily millionaire way back when but I stopped cos I didn't know what was in it. Different strokes...this our hair ehnn. It's on the list because I've used it and recommended it for peeps and they always repurchase. Never stays long in stock. Hello, just going through your post. 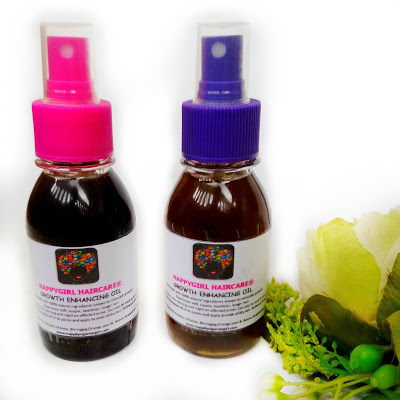 Want to know how you use manshanu for your hair? Just hearing that for the first time... I've used vitale mayonnaise, ors replenishing co but the tresemme I've used is moisture rich and it has a good slip too. Thanks, your blog really helps, keep it up.